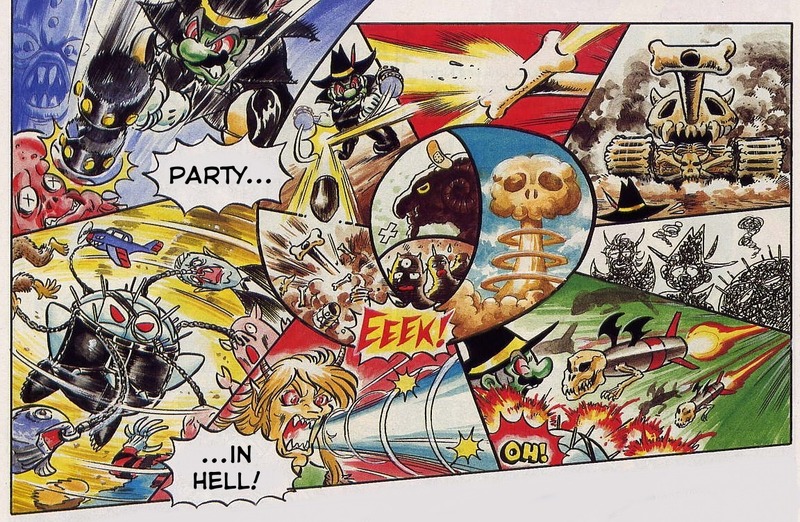 I’ve occasionally come across panels from comics in the German Club Nintendo magazine, basically their equivalent of Nintendo Power, and they were sehr wahnsinnig. Not all of them were; some were fairly straightforward adaptations of games with a few jokes thrown in, or quick gags featuring Nintendo characters. The first few are short and childish, with such compelling stories as Bowser incorrectly disposing of batteries and stealing Christmas dinner. (Oddly, one of these comics consistently confuses Bowser with Wart.) But when we get plots like Mario and his friends battling demons who’ve taken over his apartment building, an experiment by Dr. Light making Wario emerge from Mario’s body, giant ape aliens stealing the entire Earth because they think it’s a coconut, and Luigi tricking Mario into buying a Game Boy Camera by claiming it can tell the future only to find out that it actually CAN and used to belong to Satan, well, I’m not sure what to think. 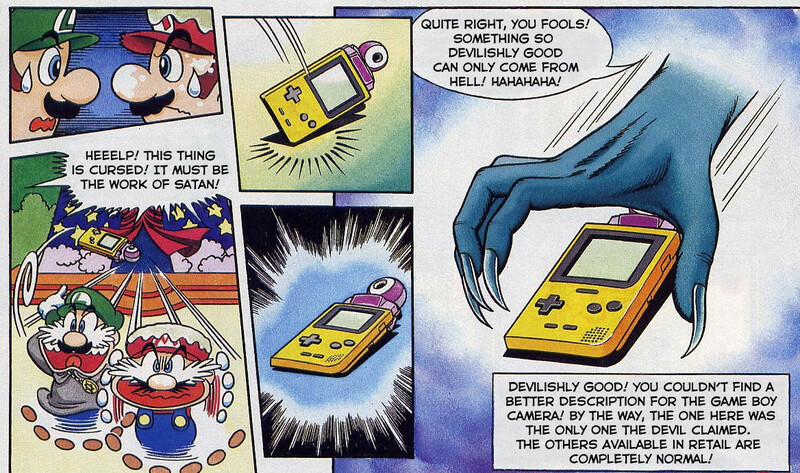 It’s no surprise that two of these stories ended up on Dorkly’s list of insane Nintendo comics. 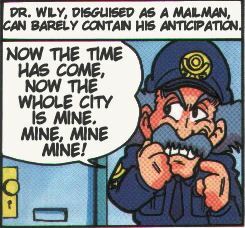 The Wario who’s Mario’s evil side is eventually merged back into the plumber, but Wario does appear in other stories, so I guess it’s like the two Negaducks in Darkwing Duck. 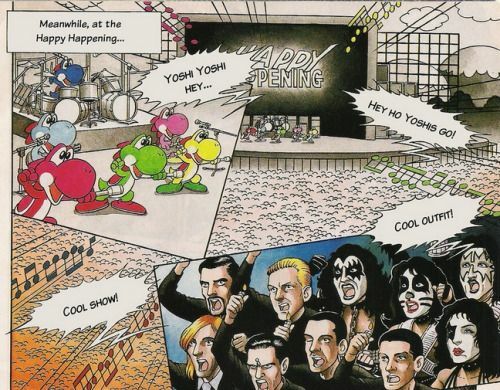 And while the Yoshi’s Island comic was essentially a tutorial for the game, the Yoshi’s Story one has the Yoshis trying to get back the color Bowser and Kamek stole by…going on a talk show and playing a rock concert. What’s also strange is how, when the setting is mentioned at all, it tends to be in the real world. 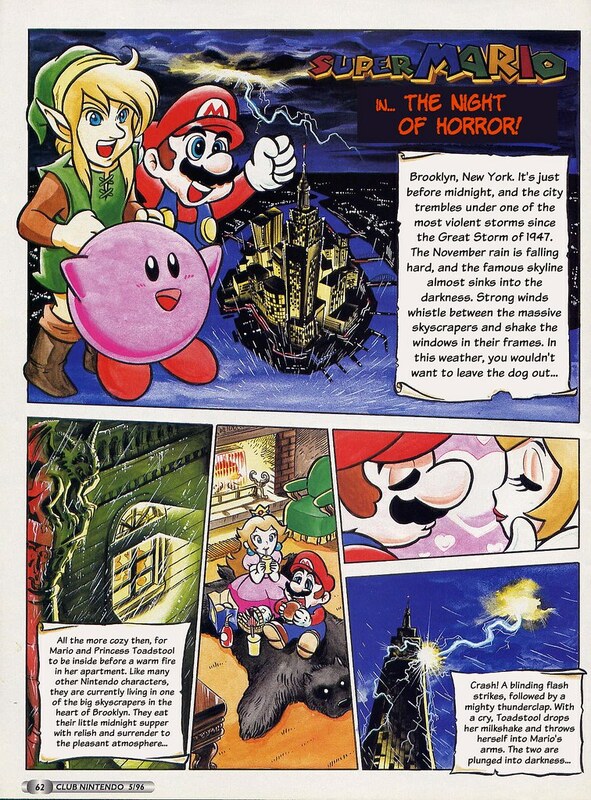 There’s a precedent for Mario living in Brooklyn, but here Link and Kirby do as well. They’re also pretty familiar with German culture for video game characters in the United States, and there’s a mention of Brooklyn having a Minister of Traffic who sets speed limits for dinosaurs. There are a few references to a popular German musician called Heino who mostly does rock covers of traditional folk songs. In one comic, a thinly disguised version of him (he’s called “Heini”) is revealed to be a Cthulhu-like alien who turns people into food so his fellows can eat them. We actually get a pretty good mix of Nintendo characters here. Dr. Light (sometimes called “Lichtblicht,” or “Lightning Bolt”) is apparently Mario’s physician (I thought he just made robots), Kirby occasionally appears in spoofs of the hard-boiled detective genre with King Dedede as his partner, Bomberman plays a significant role in several stories, and Mario takes on several members of the Street Fighter II cast. One continuing tale in which Dr. Wily sends Mario hopping through time and space crosses over with Joe & Mac, The Lost Vikings, and Plok. And this time his identity is actually relevant to the plot, unlike the other story where the Koopalings worked for an airline for no apparent reason. This database tells where you can access most of the comics in both the original German and in English translation. I took five years of German, but I don’t think I remember enough to attempt reading them in their original form. A few of the English translations mentioned don’t appear to exist anymore. The site that hosted the Star Fox story is now something totally different, and my browser told me that the Banjo-Kazooie comic was hosted on a malicious site. If you’re going to download, be forewarned that the sites employed for this launch a lot of pop-ups and such. But anyway, I recommend checking them out if you like Nintendo and…um, things that don’t make sense. I’m also interested in Super Mario-Kun, a Japanese comic that retells the various Mario games in goofy slapstick fashion. For instance, Mario beats Iggy Koopa in the Super Mario World arc by scratching a chalkboard and gluing his head inside his shell. There are a few of these that I’ve seen translated into English, but not very many. Hopefully we’ll see more in the future. This entry was posted in Comics, Donkey Kong, Humor, Kirby, Language, Mario, Mega Man, Street Fighter, Video Games, Zelda and tagged bomberman, club nintendo, demons, dr. light, dr. wily, game boy camera, heino, joe and mac, kamek, king bowser koopa, king dedede, link, luigi mario, plok, satan, super mario world, super mario-kun, the lost vikings, wario, yoshi, yoshi's island, yoshi's story. Bookmark the permalink. Hey there! It’s Milo here, I put together the database you linked and also translated many of these Club Nintendo comics. It’s so great to see your enthusiasm for these comics, it’s very inspiring! I noted the mistakes about the database, and have fixed them now hopefully. Arwing Landing is indeed gone but I’ve linked to an archive and a mirror of that comic (plus the final page I added). Opentrain also has alternate download links now at Mega, which has less popups. As for DKVine (for the Banjo comic among others), like any forum it can sometimes be regarded as suspicious but it should be fine, please check it out—the comics are worth it! But if you don’t want to deal with any of that, I’ve also added two Mega links at the very bottom; one for all raw German magazine scans and one to download English translations that I curated for myself, so that everything can be found in one place. And thank you so much for spreading awareness about these crazy and awesome comics! Thank you! I really appreciate the work you put into making these available. They’re weird, but a lot of fun. 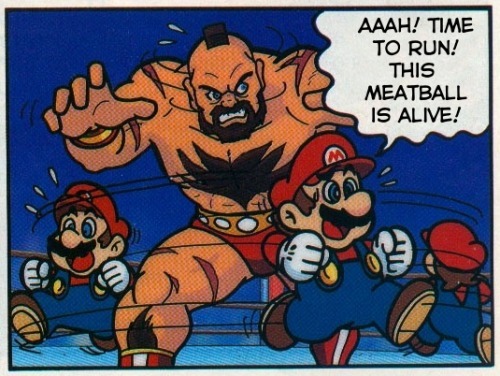 Hey, cool Mario comics, nice article!